Bryan Costabile nets a hat trick in the Irish's 10-7 win over Denver. Courtesy (UND.com). 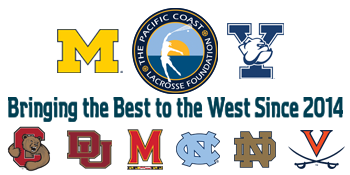 COSTA MESA, Calif. -- A pair of four-goal scoring runs fueled tenth-ranked Notre Dame to a 10-7 victory over #8 Denver Saturday night in the Pacific Coast Shootout. An enthusiastic crowd of 6,374 turned out for the sixth annual event. With the victory, Notre Dame improves to 3-1 while Denver falls to 4-2. Junior Bryan Costabile netted a hat trick for the Irish, while senior Brendan Gleason, sophomore Wheaton Jackoboice and junior Brian Willetts each scored a pair of goals. Senior Matt Schmidt backstopped the Irish with 10 saves in goal. After the Pioneers opened the scoring 40 seconds into play, the Irish rattled off the next four goals to earn a 4-1 advantage. Jackoboice evened the score before a tally by Gleason sandwiched between two markers by Willetts gave the Irish a three-goal lead. 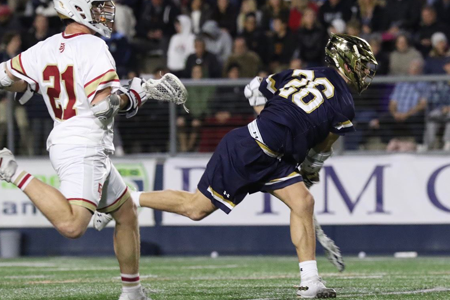 Denver made it a two-score game with 3:45 left in the first quarter before the Irish went on another 4-0 scoring run in the second frame to take an 8-2 lead. This time, Costabile opened the scoring streak with two goals before Jackoboice and Gleason each scored their second markers of the game. The Pioneers netted their third goal with 40 seconds remaining in the first half to make it an 8-3 contest at the break. Denver closed the gap to 8-6 by scoring the only three tallies of the third stanza. Costibile restored a three-goal lead for the Irish with his third marker with 12:20 remaining. Denver made it a 9-7 score with 9:18 to go before Connor Morin netted Notre Dame's 10th goal of the evening just over four minutes later.